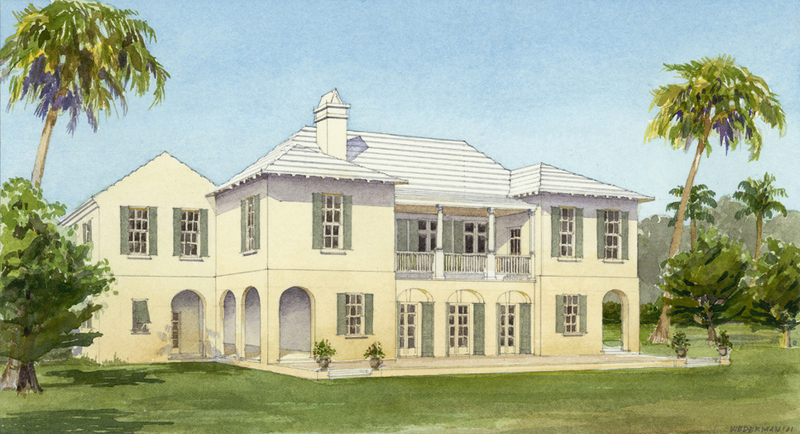 This project for a new residence on an oceanfront property was designed for a New York City couple with two children relocating to a new development on Florida’s East Coast. The design springs from the clients’ interest in Bermuda’s architectural traditions and their desire to have the house organized around a series of garden rooms on several levels. A high dune dictated that the main public rooms of the house and the master suite would be located on its second floor taking better advantage of the ocean views and breezes. The prevailing winds off the ocean also suggested that the pool be located on the land side of the house, centered on a guest suite/master bedroom pavilion, which is separated from the rest of the house by an open-air loggia at the lower level but joined at the upper level. Children’s bedrooms and service areas are also located on the lower level.